Love birds are bantam versions of parrots. There are eight different species; seven from the drier regions of African and one from Madagascar. They are beautiful, animated and playful birds that have adapted well to domestication. Love Birds measure approximately 5 to 7 inches (13 to 19 cm) in length and weigh about 1.5 to 2.5 ounces (40 to 70 grams). They are typically small and stocky, with a hooked beak and short, blunted tail feathers. Sexually dimorphic love birds are pairs that differ in appearance depending on their gender. Among the sexually dimorphic pairs are the Red-Faced Love Birds, the Madagascar Love Birds and the Abyssinian Love Birds. The Red-Faced Love Birds are bright green with paler breasts. They have green tail feathers marked with scarlet and black with under wings of black. Their faces are scarlet, with bright blue foreheads, red beaks and gray feet and legs. The female differs in that the feathers under her wings are green, and her face is more orange than scarlet and has less blue. Madagascars are the smallest types of Love Birds. Their back and wings are dark green, while their head and chest are a grayish-white, with black markings on their tails. Their beaks, feet and legs are gray. While the male and female are almost identical in appearance, there is one difference that separates them--the female lacks the gray patch on her forehead. Abyssinian pairs are also known as Black-Winged Love Birds. The male is primarily green in appearance with a splash of bright red on its forehead that extends around the eyes. Their flight feathers are black, and they have a black bar across the tail. They have red beaks and gray legs and feet. The female is entirely green with the exception a red beak and gray feet and legs. The female does not possess any of the black markings of the male. Sexually monomorphic love birds are pairs that look alike and have no gender variances. The Black Cheeked Love Birds, the Peach Faced Love Birds, the Nyasa Love Birds, the Masked Love Birds, and the Fischer's Love Birds are among those classified as sexually monomorphic. The Black Cheeked pairs are mainly green with an orange patch on the chest. They have brown heads and black faces with red beaks and gray feet and legs. The Peach Faced pairs are wide-ranging in color because of the many mutations they have undergone since arriving on American soil. The one primary consistency is their peach or rosy colored faces. The body colors come in bright yellow, greens and blues. The beaks are primarily yellow, with gray legs and feet. 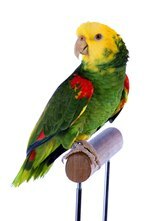 The Nyasa Love Birds are tri-colored pairs with orange heads and beaks, yellow midsections and green bottoms and tails with gray legs and feet. The Masked pairs are like the Peach Faced pairs in many ways. The Masked have also mutated to have varying body colors with a consistent black mask on the face and gray-blue underbellies. The beaks are most commonly red, but have been noted to be occasionally white. They also have the standard gray feet and legs. The Fischer's Love Birds have green backs, breasts and wings. They have golden yellow necks that progress into orange heads and faces with white rings around the eyes. The top of the head holds a patch of olive green, and the beaks are red with gray legs and feet. Love Birds can also be categorized by their eye rings; those with or without. Pairs without eye rings are the Peach Faced Love Birds, the Madagascar, the Abyssinian and the Red Faced Love Birds. Those with eye rings are the Masked Love Birds, the Fischer's, the Nyasa and the Black Cheeked Love Birds. What Are the Top Ten Talking Birds?